This summer school is an introduction to mathematical research topics for international students at the age of transition between high school and university. 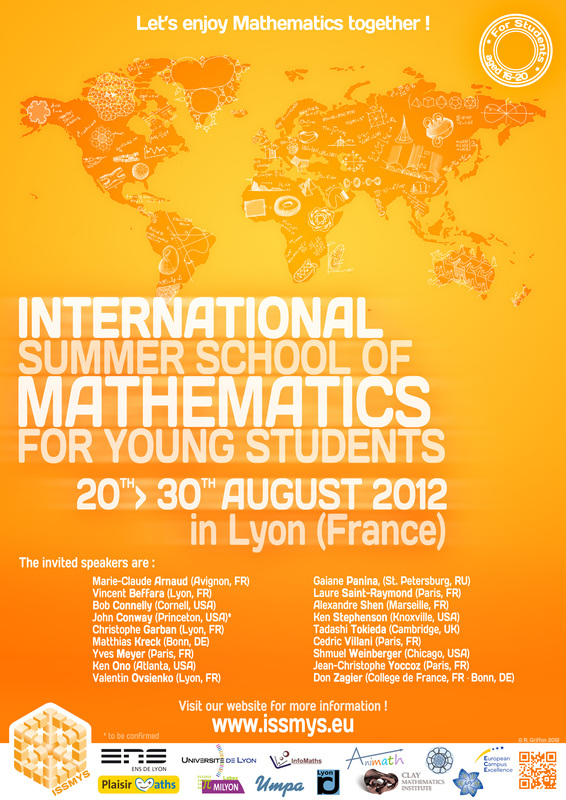 Presentations and mini-courses will be given by international university mathematicians. And the 50th anniversary celebration of the International Mathematical Olympiad (IMO 2009) in Bremen/Germany. All of these activities have created great excitement among the participants and the speakers alike. In particular, in our 2011 summer school the participants were thrilled about the great mathematicians that came as speakers and about their easy accessibility, and these speakers were impressed by the young mathematical talents they met during the school. We hope that our school will help foster connections among the international participants as well as develop the attractiveness of the European Research Area at the international level, and we hope that it will encourage international students to study in Europe and in particular in the host countries. We are very happy that some of the most prominent and exciting international research mathematicians have agreed to joining the Scientific Committee and coming to Lyon as lecturers. The scientific age of the contestants should be so that they are in their last years of high school, or in their first two years of university. Of course this means different things, in terms of preparation, for different countries. In particular, participants should have working knowledge in basic calculus, and they should not yet have specialized into any particular area of mathematics. We are committed to admitting talented students with diverse backgrounds. We hope that many young women will apply and will be admitted. We look forward to welcoming you to Lyon this August!